Just released: Upgrade to the Course Building area! Home LMS FeaturesJust released: Upgrade to the Course Building area! 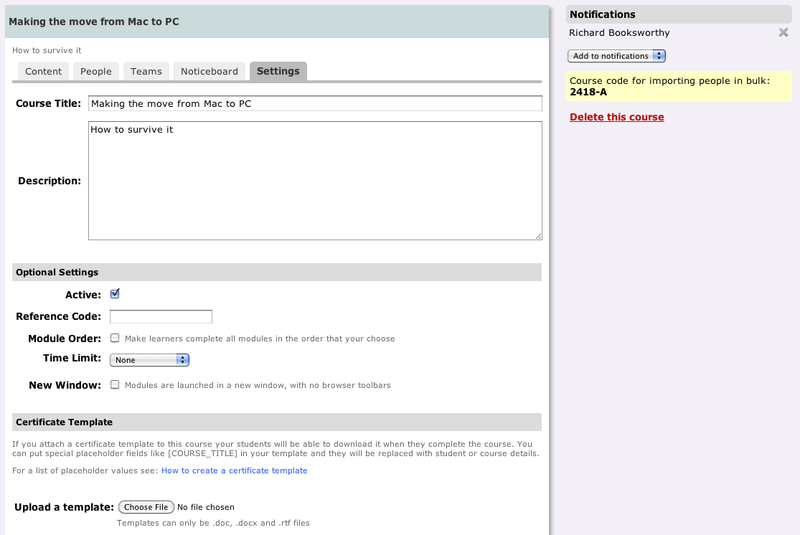 Home › Blog › Just released: Upgrade to the Course Building area! Today we've released some changes to how the course building area looks and functions in an effort to make the process a lot more efficient and user-friendly - yay! Below is a 3-minute screencast of the changes we've rolled out. If you prefer the longer version, read on below the video for a bit more info on the exact changes. When you log in to create or edit a course, you'll notice that the main course building area has been separated out in to a five distinct tabs now: Content, People, Teams, Noticeboard and Settings (see screenshot below). 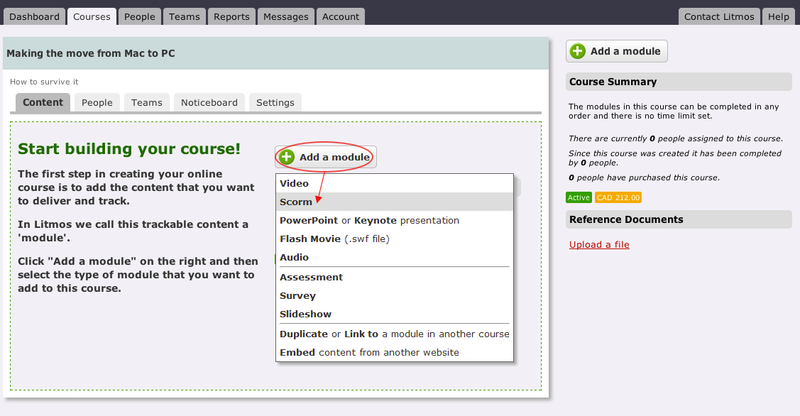 Under the content tab you will see a list of all of the modules in your course. 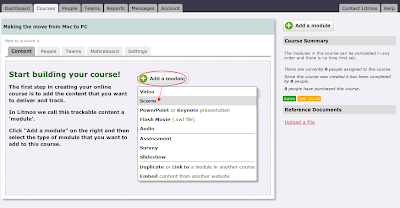 Off to the right side the 'Add a Module' button allows you to select new content that you would like to add to your course. 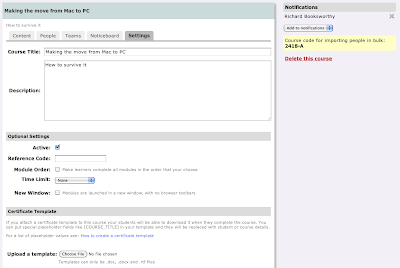 There is a brief summary of your course settings displayed below that button. Finally, the 'Additional Documents' area is below the summary. To add an additional reference document to your course just click the 'Upload a File' link and you can upload multiple files at a time. The People tab now shows who is already assigned to your course, how much they have completed of the course and if they have completed the latest version. A useful new enhancement is when you hover over a learner's name you'll see a snapshot of their profile information including their profile pic, company name, job title, email address, phone number and last login time. To add more users to your course you have the choice of two buttons on the right: 'Assign to Existing People' or 'Import new people'. This works much the same as it used to in that you can either choose from a list of existing users, or paste a comma-separated list of email addresses in to a box which will a) create the users and b) assign them to this course all in one go. The Teams tab displays teams that you have already assigned to the course, and it also gives you information on which hierarchy that team is a part of so you can be absolutely sure you have the right one. The 'Assign to Teams' button on the right allows you to search for and assign more groups of users to your course. The noticeboard area is a lot more friendly now and enables you to add notes to the course for learners to read as they are going through the content. Just use the 'Add a Note' button on the right to add some formatted text to the notes area your course. The Settings area hasn't changed since our last release so you should be pretty familiar with this by now. Off to the right you can view and add to the list of people who are set up to receive alerts about this course. The course code for the bulk import spreadsheet and the option to delete the course are below the alerts. If you're not familiar with the certificates section down the page take a look at our uploading certificates help video.